Who created this anatomically accurate model of a severed pirate head? London's Science Museum has this plaster model, supposedly depicting the head of an executed Chinese Yangstze river pirate, in its collection. But what was the purpose behind creating the model, which depicts the blood vessels, trachea, esophagus, and severed spine? The pictures below are rather gruesomely detailed. The museum believes that the model was made in England, some time during the early 20th century. 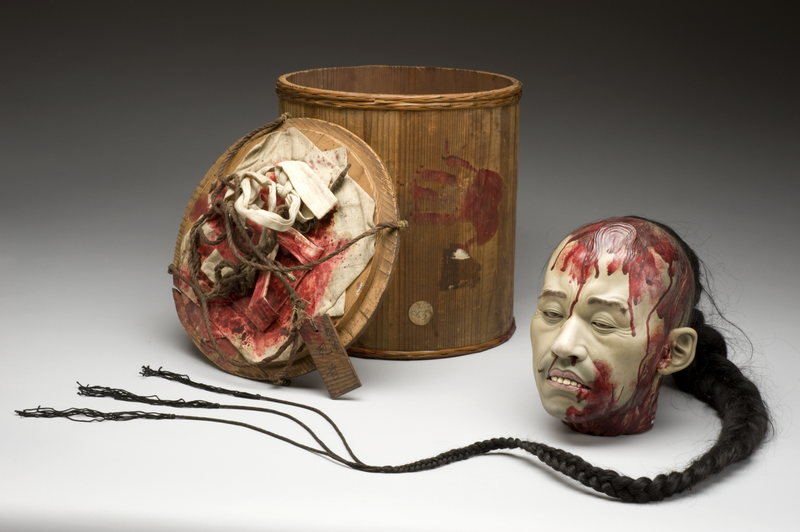 The model itself is plaster, but the ponytail is made with real human hair, and the head even has its very own "bloody" box. The museum staff believes that the model was used in some kind of exhibition, but its origin and the purpose of all that anatomical detail remain a mystery. Update: We've had so many fascinating and insightful comments on this post! If you haven't had a chance, definitely peruse the comments on this post for interesting information on English Orientalism, sideshows, and more. Thanks to everyone who has participated in this discussion!